T he day had started well. We finally had sun after much rain. The dogs were running around the yard. 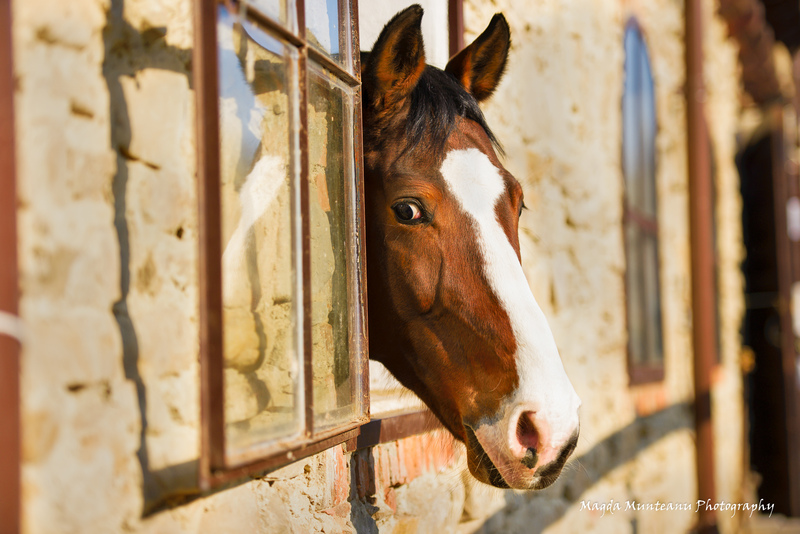 Captain Jack, Roxana’s sport horse, was curiously looking out of his window to see what we were doing. Nothing prepared us for the adventures that were to follow. I knew what I had to do. 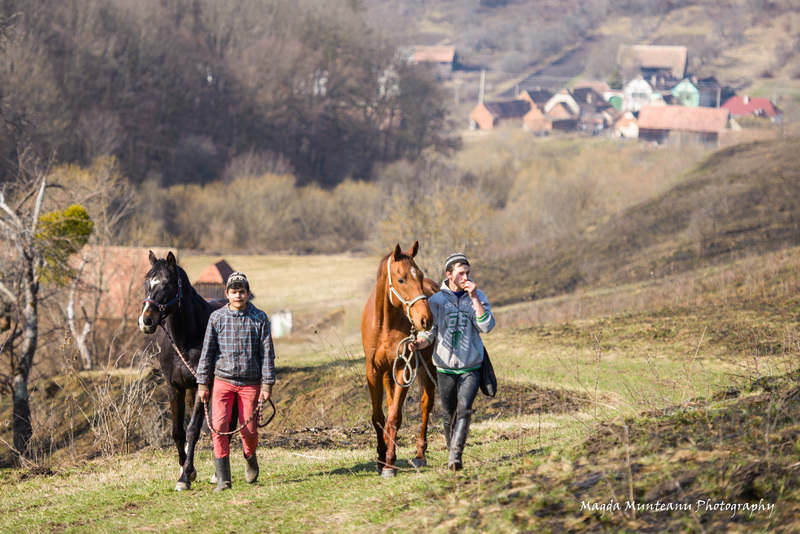 I had arrived at Villa Abbatis Equestrian Center, in the north of Sibiu country, the day before. It was a gloomy, drizzling weather. 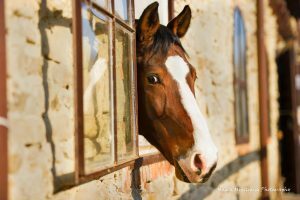 I was evaluating the place with a critical eye, looking for locations to shoot horses at freedom. The yard and its surroundings seemed a little tight. So we harnessed Cezar, a large and gentle semi-heavy Romanian horse, and headed towards the hills. We passed by the kiln where, starting with May, Hungarian artisans will make manual, traditional roof tiles. Then we saw the meadows. Pastures. Forests. All around us. Heaven. Hard to decide, all of them seemed suitable for horses. The next day we climbed up here to arrange the polls for our improvised paddock. It was so sunny, as if nature invited us to laziness. In half an hour we were ready. Our electric fence consisted of a thin wire that Roxana assured me horses knew about and avoided it. I have to admit I was a little nervous because our wire had no electricity in it this time. I saw the horses coming uphill, near the kiln. Two sport horses, Aspen and Rossini. I took my camera and Roxana let them go. As soon as they noticed they were free, they neighed and took off galloping. Directly towards the wood. They passed through our fence as if it didn’t exist. The image was beautiful. 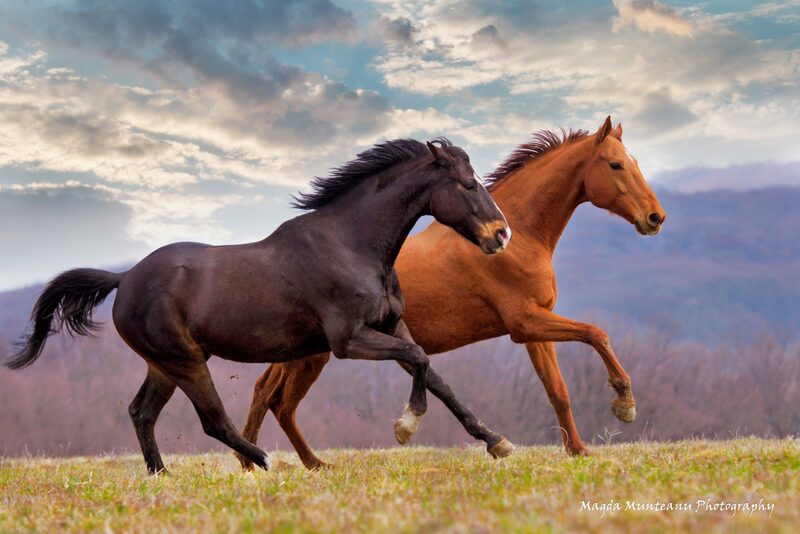 Two horses running free over the hills. But my photo session had lasted exactly ten seconds. We started looking for them. Where did they go? We were running ourselves over the hills now. On foot. After about 20 minutes we learned they went home, at the ranch. We repaired the fence, meaning we knotted the wire. This time we hang, from place to place, long red ribbons that were waving in the wind. The strategy worked. When they saw the moving ribbons, the two horses never came near the fence. Full success. The second round. 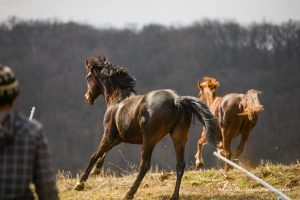 I was confidently looking at the four mares that were now climbing the hills. 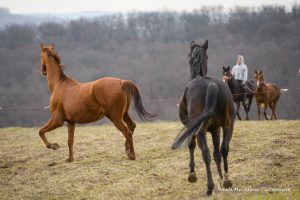 Roxana took a walk with them around the fence, to let them see the wire and the ribbons. To avoid any more surprises. She let them go and … gone they were. Directly through our fence. The history was repeating itself. Lady Bambina, a dark color mare, was leading the heard. The mares didn’t rush home, as we were hoping. We heard somebody saw them in the graveyard. Later that they were running through the village. Finally they arrived at the ranch. We were already tired from chasing the horses. It seemed as if we were running more than them. We made a last attempt. We brought back only three mares. We left the rebel Lady Bambina at home. This time it worked. Beautiful photos, sun and rain clouds that looked good in pictures. Then I asked Roxana to make the horses run, to obtain some images at full speed. Three laps. Four. It all seemed to go well, when the front mare got annoyed and broke the fence again. Three horses running free over the hills. I put my camera down and started laughing. Here we go again.